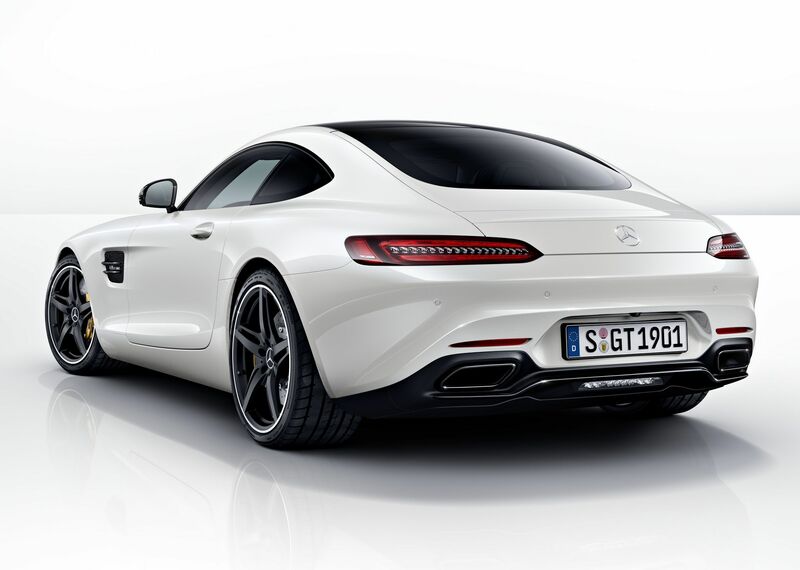 Let’s start with the important stuff: Mercedes-AMG GT will be sold (in early 2015) in two versions. First, GT will have 462 hp and 0-100 in 4.0 seconds. Second, GT S will reach 100 km / h in 3.8 seconds, thanks to increased power to 510 hp. Both will use a new engine V8 biturbo engine of 3,982 cc (internal code M178) turbine mounted within the vee and dry bath oil. This technological solution allowed the installation of the engine in a very low position to provide a low center of gravity and hence a exemplar dynamic behavior . The engine is placed in front and the gearbox SPEEDSHIFT DCT- 7 (dual-clutch automatic) is positioned in the rear to give the car a weight ratio of 47/53 (front / rear). The differential is mechanical in GT version and electronic for GT S, both promising maxim fun for those who know how to use the power of the car, but without leaving the roadway. Besides, the chassis management programs contain a civil version C (Controlled Efficiency), one S (Sport), one S + (Sport Plus) and one I (Individual) – for personal preferences. The S program is set for a circuit like the Nurburgring and the S + for one like Hockenheim circuit. The electronic management of the car was pushed for GT’s and untouched areas until now – engine and gearbox buffers are electro-hydraulic and depending on conditions, are firmer or softer, reacting at a rate of one thousandth of a second. Mercedes-AMG GT can be configured in many ways to satisfy as many requirements: two different versions of the engine power (462 and 510 hp) or active hydraulic shock absorbers, mechanical or electronic differential, standard aerodynamic kit or perfomances, wheels of 19 or 20-inch, brake discs of 360, 390 or 402 mm, made of steel or ceramic, etc – you get the idea, the GT is very configurable. A familiar example would be the curved ceiling design that’s reminiscent of the Dodge Viper. Only that this cap comes with a practical explanation, namely to allow driving with a helmet on head in racings. Was not to do it flat just because looks like Viper, right? Unfortunately, dynamic tests have not yet started, so for the dynamic behavior we must rely only on the promises of officials, who sustain that power combined with lowered chassis and superior suspension offers a sublime experience both in highway system and fast circuits . We’ll see. And so we’ll see if the idea of leaving as much mechanical and avoid electronic was a good idea. Of course, the car comes equipped with full safety package of the German mark, but 500 horsepower let loose after disconnecting ESP’s become dangerous for roadside poles if at the wheel is not the right person. But instead putting the worst first, better to enjoy and applaud the arrival of a remarkable car, thinking of the first races, either on Ring or Hockenheim .